Discount vouchers promise so much, but are more often than not out of date or include small print that makes then useless. It’s really annoying to search for a voucher code, but when you enter it find out that you had to use it a month ago. 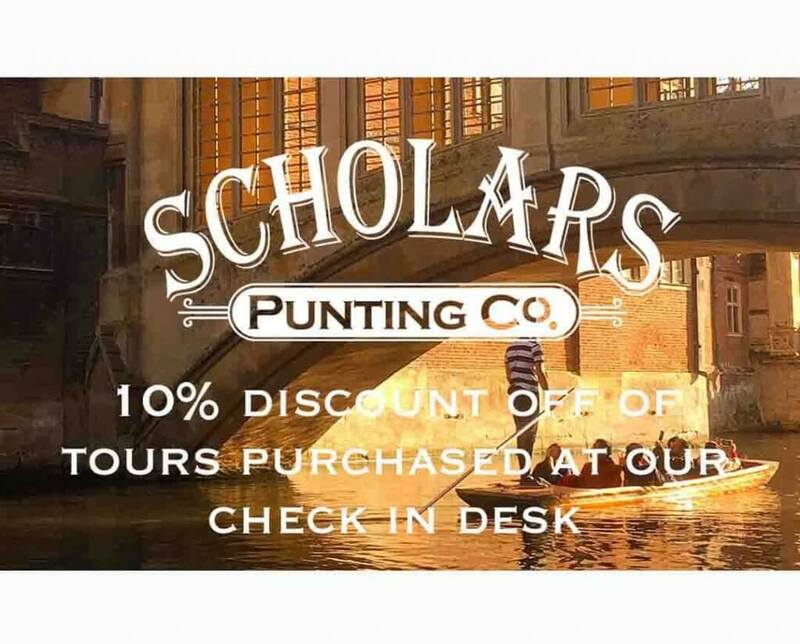 At Scholars Punting Cambridge we decided to create a discount voucher that can be used all year at any time, with no restrictions. This voucher is for use in person when booking on the day at our check-in desk at the quayside. No prior reservations are required, simply show a copy of the voucher when you go to pay. This will entitle you to 10% discount on our in-person prices. You could either print a copy of the voucher or have it visible on the screen of your mobile telephone. Alternatively, have the voucher permanently tattooed on to your person and receive an addition 5% off every purchase. Our in-person prices are considerably more expensive than our online prices, so even with the 10% discount, you will still pay slightly more than if you book online. For that reason, we recommend that you consider pre-booking via the website. The advantage of using this discount voucher in-person, is that there is no need to use a credit card online, which some people are nervous of doing because they are frightened of online fraud. When you use the voucher it is important that you present the voucher at our check-in desk, and don’t engage the street touts. Engaging with a Quayside street tout could render your voucher void. This act could cause our touts to have to go to the back of the touting queue, and or cause our company to incur commissions to the tout irrespective of whether they are employed by our company or another company. We will only issue your 10% discount if we don’t incur any of the above penalties. Many vouchers come in the form of a voucher code which can be redeemed online when you make an online booking. The voucher featured in this blog is not for online bookings, but if you would like an online voucher code for punting, then please click here. Simply enter the voucher code when you book a tour online. There are many places to park including Park street carpark, Grand Arcade car park, many pay and display areas and a choice of two park and rides. Equally, you could arrive by train or bus. The train station is located about a mile from the city centre, so you may wish to take a taxi or a bus into town. The bus station is located conveniently within the heart of the city centre. To find out more about transport, please visit our access statement. Cambridge is a wonderful city full of history and culture. It has quite a small city centre which is packed with tourist hotspots. These are generally built around the Cambridge Colleges, although there are some religious buildings such as Great St Mary’s church. You can easily see the sites in a single day. Some sites are visible by walking, but the classic views are always from the river in a punt. The punting is at its busiest between 1300-1600, so that is the time to avoid if you want a more peaceful tour. For Tourists who wish to see some historic sites, the best walking route is along the Kings Parade which takes you past the fronts of the main college sights. We recommend that you start at Kings College, then take the kings Parade north past Caius, Clare, Trinity and finally St Johns. At the end of the kings Parade is the round church, this is a very old Saxon Church which is worth a look. From Kings Parade turn left down Bridge Street, located alongside the bridge is the quayside where you will find our check-in desk. You should allow around half an hour before you depart, this is the perfect time to grab a coffee from one of the quayside cafés. The punt tour takes around 45 minutes, it takes you past seven colleges and nine bridges. You will see the colleges you walked past, but also Trinity Hall and Queens. The colleges are far more accessible by the river than on foot, this is because in years gone by major supplies such as food were delivered via the river. After enjoying your punting tour we suggest that you use the knowledge that you gained to choose a couple of colleges to walk around. The entry fee is around £10 per person per college. You should allow about an hour per college, we recommend King’s college because of its amazing Chapel and St Johns because of its vast network of Courts which are in a variety of historic styles.